Wyatt Hubbard, 7, with his mother, Tiffany McCune, and stepfather, Trevor Smith. Seven-year-old Wyatt Hubbard was a bit too focused on his right arm and its brief encounter with a needle to fully grasp the bigger picture. The needle was the first step to begin the infusion of a therapy just approved by the FDA for Duchenne muscular dystrophy (DMD), a rare and devastating disease that affects boys. Wyatt became the first DMD patient in Ohio and undoubtedly one of the first in the country to receive Exondys 51 (eteplirsen) since it became available on the commercial market. After showing great promise in a clinical trial, it was granted accelerated approval by the FDA in September 2016. 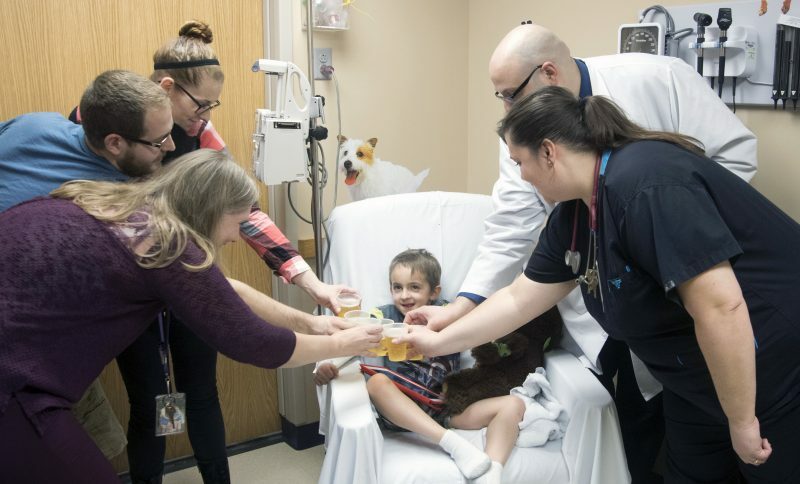 The moment the infusion began on Feb. 23 – marked by a toast of sparkling apple juice followed by a high-five between Wyatt and Dr. Kathy Mosher – was preceded by weeks of work by dozens of employees at Akron Children’s to bring the new treatment to Wyatt and other patients like him. With sparkling apple juice, Wyatt and his parents toast with Dr. Kathy Mosher (left), Dr. Ian Rossman (back right) and Tami Cieplinski, nurse program coordinator in neurology. 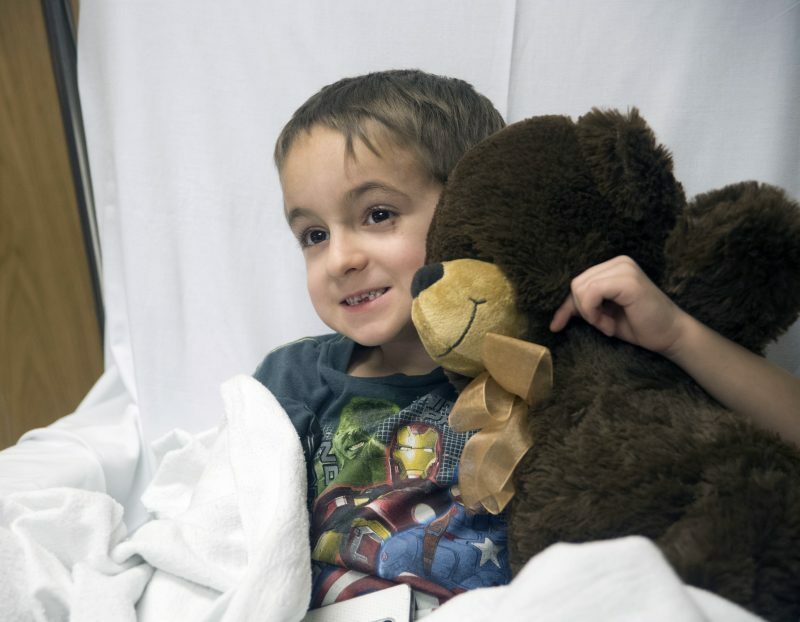 Meanwhile, Wyatt’s parents were still processing the news that they had received just 6 months earlier when a genetic test confirmed Wyatt had DMD, characterized by progressive muscle deterioration and weakness. DMD is caused by an absence of dystrophin, a protein that helps keep muscle cells intact. The first symptoms are usually seen between 3 and 5 years of age and worsen over time. Patients typically lose the ability to perform activities independently and often require use of a wheelchair by late childhood or early teens. As the disease progresses, life-threatening heart and respiratory conditions can occur. Boys with DMD can have one of many genetic mutations and Sarepta Therapeutics of Cambridge, Mass., the company that manufactures Exondys 51, is working on targeted therapies for each. But Wyatt is fortunate to have the most common mutation (representing 13% of all DMD patients), giving him access to the first FDA-approved therapy for patients with a confirmed mutation of the dystrophin gene amenable to exon 51 skipping. “Exondys 51 was approved under the accelerated approval process because the results were so compelling,” said Dr. Mosher. The manufacturer received a rare pediatric disease priority review voucher, which comes from a program intended to encourage development of new therapies for the prevention and treatment of rare pediatric diseases. This is the 7th rare pediatric disease priority review voucher issued by the FDA since the program began. Tami Cieplinski, nurse program coordinator in neurology, helps Wyatt get set up for the injection. Dr. Ian Rossman, a pediatric neurologist, explained the role of a clinical trial for Wyatt’s mother, Tiffany McCune, and stepfather, Trevor Smith. “The two key questions are ‘Does it work?’ and “Is it safe?’ and safety always takes priority over everything else,” he told them. Wyatt will need an infusion once a week for the rest of his life. After a few weeks, the infusions can be done at home. According to Tiffany, concerns about developmental delays began after Wyatt’s first birthday when he was slow to begin walking. 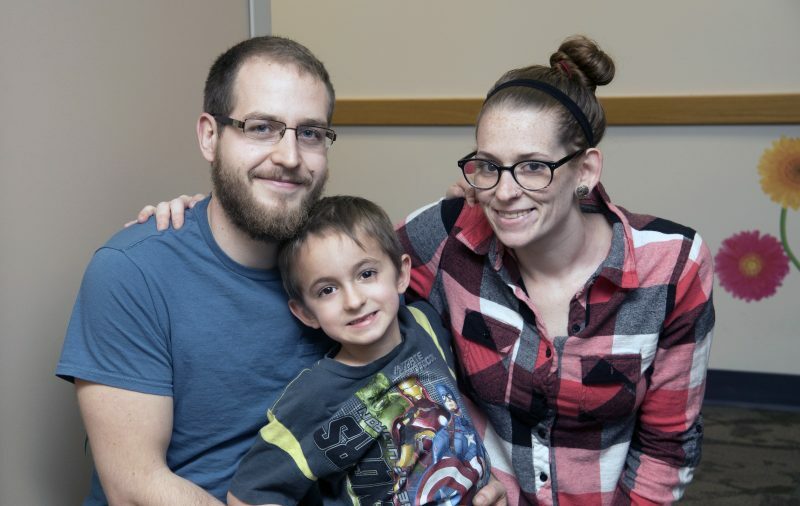 Over time, his preferred way to walk – on his toes – cued a referral to Akron Children’s neurology department and genetic testing. Still, Tiffany said, Wyatt, a first grader at Willyard Elementary School in Ravenna, doesn’t let anything stop him. When the family arrived Thursday, they were greeted by Drs. Mosher and Rossman and Tami Cieplinski, neurology nurse program coordinator. They, along with social worker Noelle Buso, led the behind-the-scenes efforts to get pharmacists and nurses trained in the handling and use of the drug by the manufacturer, building a new order set in the hospital’s electronic medical record, and making sure the expensive new medicine (at $300,000 a year) was covered by the family’s insurance. Dan Strunk, a clinical operations supervisor for the NeuroDevelopmental Science Center, stopped by to meet the “celebrity” patient. “I’ve seen your name about a thousand times,” he told Wyatt. After “uncorking” 2 bottles of sparking apple juice and animal crackers, Dr. Rossman made a toast to Wyatt’s good health, with plastic cups meeting ceremoniously. 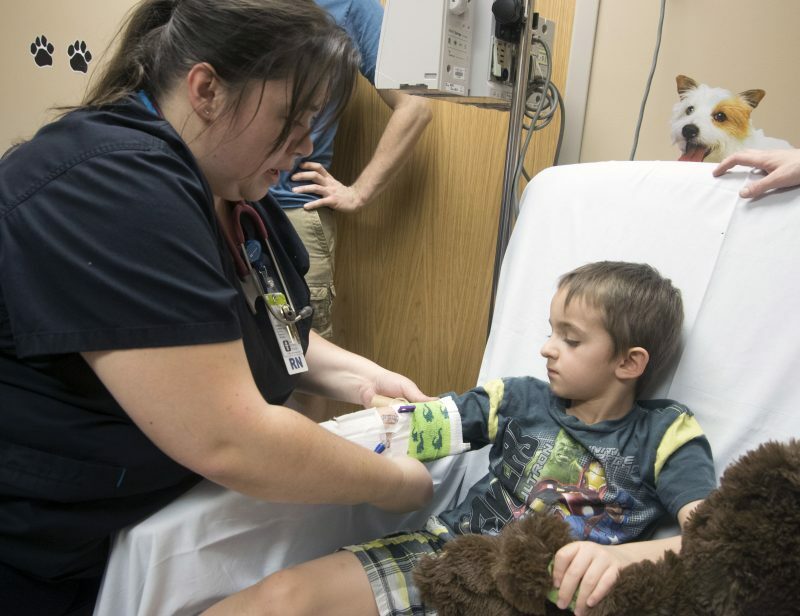 “Wyatt’s going to have big expectations when the flu shot comes,” joked Dr. Rossman. Then, as comfy as he could be with a new teddy bear, an iPad packed with more than enough games to keep him entertained for the next hour and snuggled in a warm blanket, the vital medicine starting flowing into Wyatt’s right arm. 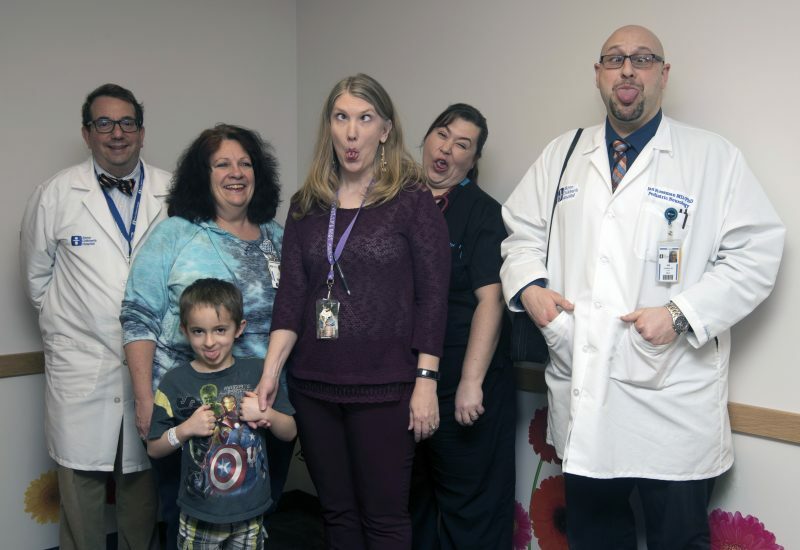 Getting silly with Wyatt are (from left) Dr. Bruce Cohen, Ann Puzaculiks, RN, Dr. Kathy Mosher, Tami Cieplinski, nurse program coordinator in neurology, and Dr. Ian Rossman.